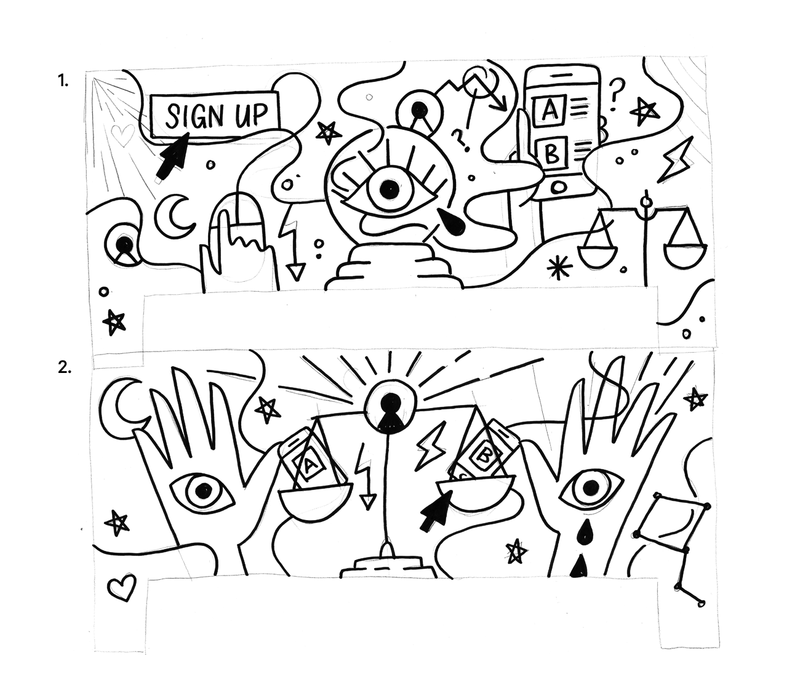 From left to right: Pieces by Kelsey Wroten, Hallie Bateman, Henrique j. Tramontina and Laura Bohill, commissioned for the Inside Intercom blog. When we revamped the Inside Intercom blog, we wanted to provide readers with a truly editorial experience — something you would get from reading a high quality editorial publication, and not a run of the mill corporate blog. Key to that was working with a wide array of talented illustrators and artists from around the world to help bring our posts to life. Regular readers have come to love these pieces, and how they creatively interpret blog posts on topics as varied as how to track the right company metrics to tips on providing great customer support. We asked Stewart Scott-Curran, head honcho at the Intercom Brand Studio to take us behind the scenes on the process. 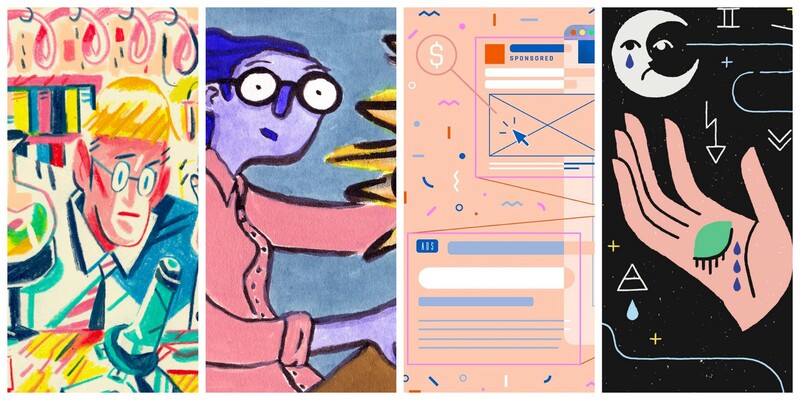 How do you find the illustrators that contribute to the Inside Intercom blog? I’m always on the lookout for people whose style would be a good fit for us and I keep a roster of illustrators whose work I know, or who I’ve come across on Dribble or Behance. Sometimes an illustration in a publication like The New York Times, Wired or Slate will catch my eye and I’ll find out who worked on it and check them out. Do you look for any particular style or approach? We tend to stay away from super clean, vector illustrations that you see in a lot of other places. We try to keep it a lot more organic, loose and expressive. One of the opportunities we had when we started thinking about these images was taking a more editorial approach. Much like the design of the blog itself, there’s no reason why it shouldn’t look editorial, like something you might see in Fast Company, and not just another company tech blog. What’s the process to get from commissioned to finished piece? 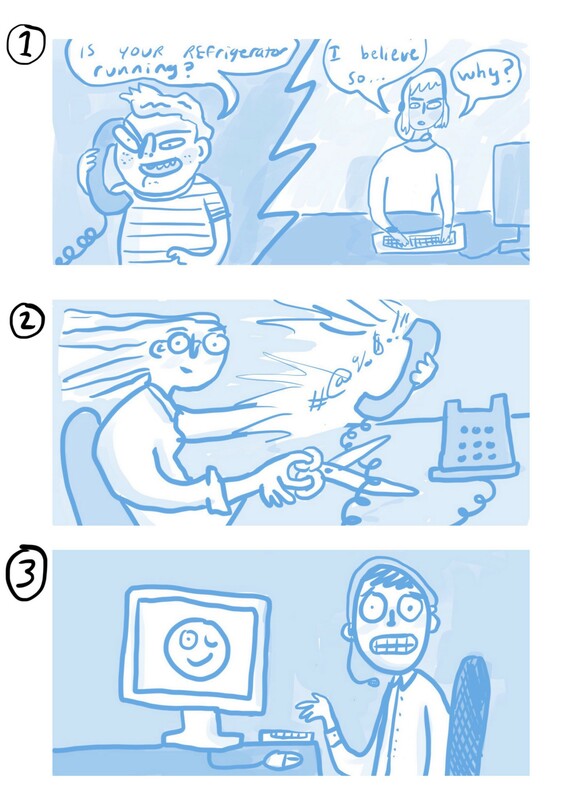 We generally just send the illustrator a draft of the blog post and let them have at it. We keep it pretty simple, and tell them to feel free to interpret the post in any way they want. It’s okay to get a little bit weird, or a little bit abstract, and to have some fun with it. The best ones are the ones that don’t translate the content of the post too literally, that are little bit left of field. We don’t get prescriptive, we like to give the illustrators we work with a lot of freedom. Occasionally, if we come across someone who has done lots of work in different styles, we’ll reference one or two of of their previous pieces as something we feel would work for us. What advice would you give to illustrators looking to catch your eye? We’re always looking for new contributors. I’m happy for anyone to reach out to me on Twitter if they think their work would be a good fit, or reach out by sending us a message through Intercom. Intercom makes messaging apps for businesses that help them understand and talk to customers. Check out more illustrators on the Inside Intercom blog, where we regularly share our thoughts on startups, company culture, product strategy and design.